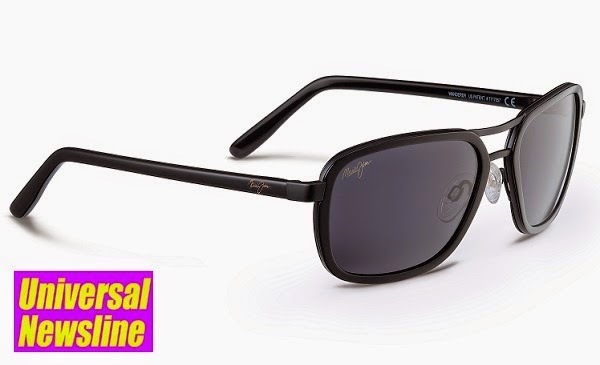 New Delhi, July, 2014: For those among you who love to revisit the styles from the past, there is a fresh offering this month from Maui Jim, the makers of the world’s clearest non-glass sunglass lenses. Wanderer, a classic double bridge aviator style sunglass inspired by the 1961 song ‘The Wanderer’, is sure to sweep you off your feet. A sleek new modified aviator, which is extremely comfortable and lightweight is a perfect companion for every kind of lifestyle. So, if you love to be on the road, Wanderer is perfect eye protection for you; and if you are a social animal who loves formal dos, then again Wanderer suits you well. Inspired by the 1961 Dion song ‘The Wanderer’, that relates the story of a man who loves to travel, the sunglasses evoke the eternal Wanderer and outdoor lover in you. Yet, it is also ideal for formal events. This retro rectangular aviator struts a set of attached acetate overlays that dress up a contrasting Monel nickel-silver frame. Offering a clip-on look, Wanderer is designed for medium-sized oval, round or oblong faces with a unisex appeal. This ultra-light frame has a padded, adjustable nose bridge and spring hinges that add stability. Priced at Rs. 15,800 Wanderer sunglasses provide exceptional comfort and style and is available at all leading optical stores in the city. “Wanderer sunglasses are available in three color options each of which offer a completely different look. If you’re headed off to work, put on a pair in Gloss Black with Neutral Grey lenses that block the most light for bright sunny days. For an afternoon with friends, Wanderer in Matte Espresso with HCL® Bronze lenses can go from afternoon to evening and handle any light conditions. For the day when you want to make a statement, this style in Tokyo Tortoise with HCL Bronze lenses offers a more aggressive take on your typical tortoise frame for a memorable look,” says Mr. I Rahumathullah, Managing Director, Maui Jim India. Maui Evolution® lenses offer brilliant, edge-to-edge clarity combined with durability that can withstand more aggressive activities. Proprietary CLEARSHELL® coating provides excellent scratch-resistant protection on both sides of each lens. All Maui Jim lenses use patented PolarizedPlus2® lens technology that has received the Seal of Recommendation from The Skin Cancer Foundation as an effective UV protectant. The technology cuts 99.9 percent of glare and eliminates 100 percent of UVA and UVB rays while significantly boosting color, definition and depth perception. Maui Jim’s sunglasses are recognized as safe and effective sun protection and are an important part of an effective defense program against skin cancers of the eye and eyelids. Maui Jim has been voted favorite sunglasses company and best sunglasses by optical retailers and many of the top health, fitness and outdoor sports media around the world. All Maui Jim sunglasses have been awarded the Seal of Recommendation from The Skin Cancer Foundation as an effective UV filter for the eyes and surrounding skin. Maui Jim was “born” with an original line of seven sunglass styles. Up to 1991, the sunglasses were exclusively sold in Maui, Hawaii. In 1991, the company was purchased by Hester Enterprises, and in 1994, Hester enlisted RLI Vision Corporation of Peoria, Illinois, to be the mainland distributor of Maui Jim Sunglasses for the ophthalmic market. Maui Jim, Inc. was established in December 1996, when Maui Jim Sunglasses acquired RLI Vision. Today, the company sells more than 86 styles and 200 SKUs and is the fastest growing polarized sunglass maker in the world. For more information on Maui Jim, visit MauiJim.com or follow us on Facebook or Twitter at @OfficialMaui.